Looking for quality wood weave blinds at a competitive price? Look no further than Premier Blinds. We sell and install high-quality made to measure wood weave blinds throughout South Wales. These blinds make a great addition to kitchens and conservatories or any other room that doesn’t rely on privacy but would benefit from the affects of gently filtered light. Made using exotic woods or bamboos they create a beautifully natural look. Wood weave blinds utilise the Roman style and as such are easy to operate. Using a side chain you are able to move the blinds up and down. It is important to note that wood weave blinds can never be fully closed off due to them being pieces of real wood weaved together, instead of cutting off the light entirely they gently diffuse the light providing a soft ambient effect. Wood Weave blinds are perfect for kitchens and conservatories where privacy isn’t essential, the blinds to provide a moderate amount of privacy but due to their design are unable to completely block out the outside world. The natural look of the wood weave makes them a great addition to your conservatory as they fashion a natural transition from your garden to your home. 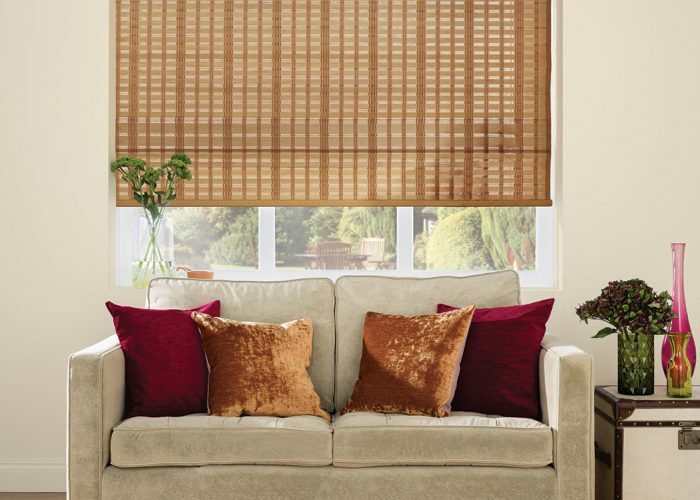 We supply and fit an extensive range of wood weave blinds, from a wide selection of luxury woods. Choose from beautiful colours such as Pine, Beach, Birch or Oak to create a style that fully compliments your interior decor. All of the woods we use are gathered from renewable sources so you don’t need to worry about the environment when choosing your perfect wood weave blind. Contact us today to discuss your options. Our specialist window blind installers will be able to help you decide which design will look best in your home. We can also provide free quotations and will fit the blinds for free ensuring that they are robust enough to withstand the strains of everyday life.